[Editor's Introduction by Susan Ohanian. Even the name is likely to make most teachers I know roll their eyes. How can a teacher who is engulfed by the data flooding her classroom, the Rubric Queens patrolling the hallways, and the day-to-day worry over daily classroom routines(which are never routine) worry about an outfit called the American Legislative Exchange Council (ALEC)? The administrators of United Opt Out offer some info to show us who ALEC is and why we should care. United Opt Out is an organization you need to know (http://www.unitedoptout.com). They are parents, educators, students, and social activists who are dedicated to the elimination of high stakes testing in public education. ]. Bill Gates as Big Brother. Although the "education reform" money from the Bill and Melinda Gates Foundation supports the kinds of projects that ALEC provides legislation for, Gates is less prominent in ALEC than other billionaires. 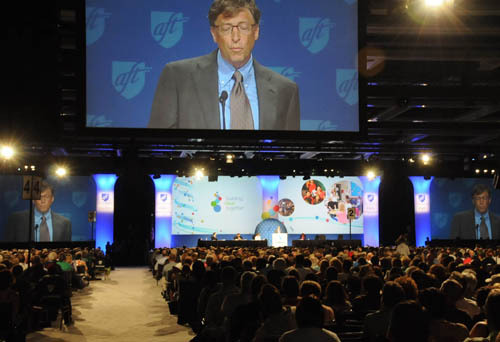 Above, Bill Gates, at the invitation of American Federation of Teachers President Randi Weingarten, spoke to the AFT convention in Seattle on July 11, 2010. Substance photo by George N. Schmidt.Written by the administrators of United Opt Out (www.unitedoptout.com) : Morna McDermott, Peg Robertson, Shaun Johnson, Laurie Murphie, Ceresta Smith, and Tim Slekar, and with a special thanks to Susan Ohanian for her editorial assistance. Remember that parlor game “Six Degrees of Kevin Bacon?” It is always great fun to see how, within six degrees of separation, everyone if connected to everyone else. We propose a variation on this game. We call it “Six Degrees of ALEC,” in which we find that all the sponsors of the recent Education Nation event hosted by NBC this fall were within six degrees of separation from the American Legislative Exchange Council (ALEC). Education Nation Summit, televised in September 2011 “was held at Rockefeller Center in New York City, and convened educators, parents, policymakers, elected officials, business leaders, students, and engaged citizens in a national discussion on the issue of improving education” (LINK: http://www.educationnation.com/index.cfm?objectid=BBCEDAC1-D338-11E0-810D000C296BA163). Don’t be surprised if you haven’t heard of ALEC. They work hard at keeping the media out of the meetings where they hatch plans for their right wing, free market model legislation that fits the needs of their corporate members. For example, as attorney Miles Mogulescu (LINK: http://www.huffingtonpost.com/miles-mogulescu/alec-states-unions_b_832428.html ) pointed out in the Huffington : ”ALEC’s fingerprints are all over the anti-union legislation we’ve seen popping up in Wisconsin, Ohio, Indiana, Michigan, Tennessee, Oklahoma, and numerous other states.” NBC’s widely publicized event Education Nation offers us opportunity to look ALEC up close and personal. But first, we must ask “What is ALEC?" According to ALEC Exposed (LINK: www.alecexposed.org), "Through the corporate-funded American Legislative Exchange Council (ALEC), global corporations and state politicians vote behind closed doors to try to rewrite state laws that govern your rights. These so-called "model bills" reach into almost every area of American life and often directly benefit huge corporations. One might argue that big business has historically been “in bed” with politicians and legislation-it’s the capitalist way of life, right? But ALEC is bigger than that”. Council,1 uses poor and misleading methods to draw some very controversial findings.” He sums up his analysis with the observation that despite being clad with myriad numbers and statistics, ALEC offers rhetoric, not research. And it is rhetoric driving current education reform today. This might explain how and why current educational reform movements have been taking on the enormous force across our country despite the resistance to such reforms from criticism of such reforms from such noted scholars as Richard Rothstein, David Berliner, and Keith Baker and from journalists such as Pulitzer Prize winning Michael Winerip, and Black Agenda managing editor Glenn Ford. Mickey Revenaugh, Co-Founder and Senior Vice President of State Relations of Connections Academy, an on-line school venture based in Baltimore, MD is the corporate co-chair for ALEC Education in 2011. The other ALEC Education co-chair is David Casas (R-Georgia). (LINK: http://alecexposed.org/w/images/9/9a/2D1 Charter_Schools_Act_Exposed.pdf. The second largest donor to David Casas’ 2008 election was a group called Friends of Mark Burkhalter, who is also a Republican State Representative from Georgia who serves as Speaker Pro Tempore of the Georgia House of and is a former aide to U.S. Rep. Newt Gingrich. (LINK: http://onlineathens.com/stories/120509/gen_532111802.shtml). •	*Gov. Nathan Deal (Ga.) R ALEC Press Release: (May 17, 2011) - The American Legislative Exchange Council applauds Governor Nathan Deal of Georgia for signing House Bill 47 into law. •	*Gov. Mary Fallin (Okla.) R ALEC event: U.S. Rep. Mary Fallin of Oklahoma discusses federalism at the American Legislative Exchange Council's States and Nation Policy Summit, December 4-6, 2008 in Washington, D.C.
•	*Gov. Bill Haslam (Tenn.) R Governor Bill Haslam signed legislation right out of the ALEC Tort Reform manual. Seven out of ten state spokesmen deeply involved with an organization intent on “clubbing teachers” makes one question just what kind of an education nation NBC has in mind. KIPP Schools, Edison Schools, The Bill and Melinda Gates Foundation, Center for Educational Reform (a school choice site) and Ford Motor Company (Also in ALEC). Bob Wise serves on the committee for America Promise Alliance. He is also the President of Alliance for Excellence in Education which is part of ALEC. He presented on "National Board's Turnaround Initiative to Grow Great Schools" at the Education Task Force Meeting at the 2011 ALEC Annual Meeting. Bob Wise is the former governor of West Virginia. He currently co chairs the Digital Learning Council with Jeb Bush, former governor of Florida, and chairs the National Board for Professional Teaching Standards. He is also author of the book Raising the Grade: How High School Reform Can Save Our Youth and Our Nation. Gov. Wise joined the Alliance in 2005, where he continues to build its reputation as a respected authority on high school policy by advocating for reform in America’s secondary education system and working to ensure that all students graduate from high school prepared for college, careers, and to be contributing members of society. Gov. Wise has become a sought-after speaker and advisor on education issues; he has advised the U.S. Department of Education, White House Transition Team, and frequently testifies before the U.S. Congress. State Farm serves on the Corporate Board for ALEC. They are the recipient of ALEC's 2011 Private Sector Member of the Year Award, and a "Chairman" level sponsor of 2011 ALEC Annual Conference. CEO Edward Rust’s education involvement includes: co-chair Business Coalition for Excellence in Education, Chair, Business Roundtable Education Task Force, chair National Alliance of Business, Co-chair Committee for Economic Development Subcommittee on Education Policy, Achieve member of board, McGraw-Hill member of board, American Enterprise Institute board of trustees, President-elect Bush the Elder’s Transition Advisory Team Committee on Education. One of the key developers of the National Common Core Standards (NCCS), ACHIEVE, is directly funded by State Farm. Additionally, another central developer of NCCS, ACT, has Dixie Axley on their Board of Directors. Dixie Axley works for State Farm. Although the next four Education Nation sponsors may not be ALEC members, their ties to the organization are close. They support many organizations and efforts that promote privatizing public education. This organization supports many free market, school choice, charter school and privatization corporate model initiatives too numerous to count. However, here are some of the central school “choice” efforts that Gates Foundation developed or helped to fund: America’s Promise Alliance (in ALEC), New Schools Venture (who bring you the KIPP and EDISON school projects, and which also funds the National Center for Education and Economics [NCEE] which in turn developed the NCCS), The New Teacher Center, Pearson (the publishing company leading the NCCS charge), Ed Trust (also sponsored by Lumina, Walton Foundation and State Farm-all active members of ALEC). Ed Trust is one of the pet projects developed by Michelle Rhee. The NCEE itself was originally funded by the Gates Foundation. Their connections in decision making power within scores of for-profit school reform initiatives and their financial relationships with the Teachscape the educational technology organization promoting new teacher evaluation systems make their agenda for educational policy clear. Additionally, one reporter Shamus Cook offers a damning litany: “The Kellogg Foundation is most notorious for spearheading the attack on public education. Along with the Bill Gates Foundation and others, the Kellogg Foundation gives vast sums of money to encourage the formations of for-profit charter schools.’ (LINK: http://www.globalresearch.ca/index.php?context=va&aid=19582). “Others” that we wish to add include the Wallace Foundation whose links in and around free market education agenda tied with ALEC are far reaching according to Susan Ohanian (LINK: http://susanohanian.org/show_research.php?id=445 ). Scholastic’s ventures to put commercial messages traveling as curriculum into public school classrooms do bring it within six degrees of ALEC. In 2010, the U.S. Chamber of Commerce joined with Scholastic Books to distribute roughly 100,000 books about the potential perils of government fossil fuel regulation to classrooms across the country, as part of its “Shedding Light on Energy" campaign. According to ALECexposed, “U.S. Chamber of Commerce, a powerful business lobbying group in the United States that has become a fully functional part of the partisan Republican machine since CEO and president Thomas J. Donohue took office in 1997.” (LINK: www.alecexposed.org) Scholastic has worked directly with the Bill and Melinda Gates Foundation to publish a research report called Primary Sources: America's Teachers on America's Schools 2010 (LINK: http://mediaroom.scholastic.com/taxonomy/term/581). The agenda outlined in this study directly mirrors the agenda put forth by the ALEC Education committee and the myriad of free market corporate-sponsored reform efforts with which they are associated (by six degrees or less). Our findings suggest that big business is not in opposition to “big government.” Rather, big business owns big government. Where is the U.S. Department of Education in all of this? “All over the place” is not a very scholarly answer but maybe it fits right now. The corporate-agenda has connections with the research and data put forward by the U.S. DOE (Broad Foundation has provided “research” to the DOE, as has The Alliance for Excellence in Education which is a member of ALEC). We might well ask why the U. S. Department of Education shares an agenda with organizations set on destroying public education, but that's the subject for another day.